Chexpire is in "beta" release: only few TLD (.com/.net/.org/.fr) are verified for domain name checks and TLS 1.2 is not supported for SSL checks. Please report issues. Never forget to renew a domain name or SSL certificate. 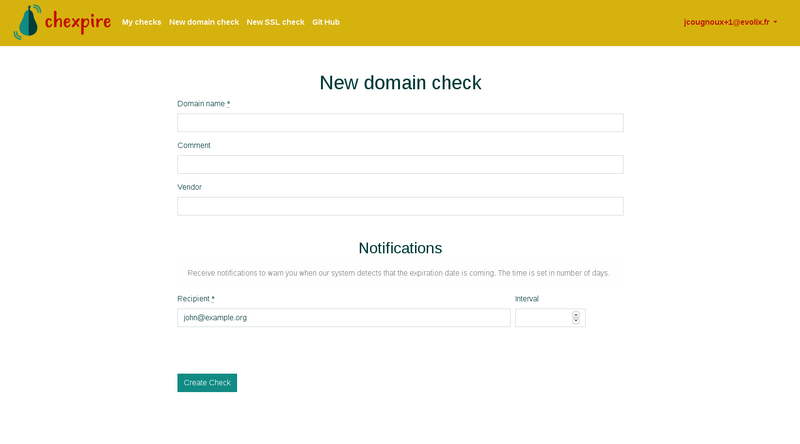 Chexpire is a Free Software (AGPLv3 license) to manage the expiration of domain names and SSL certificates. It is primarily an ergonomic web interface that allows you easily to add new domain names/SSL certificates to monitor, and custom/unlimited notifications to be notified before expiration. Do you have domain names at different registrars? many Let's Encrypt SSL certificates with automatic renewal? You will enjoy everything centralized in a web interface: adding a domain name/SSL certificate in two clicks, sorted list, search bar etc. Want to send an email 42 days before expiration? to multiple email addresses? receive 10 days before expiration on an emergency address? 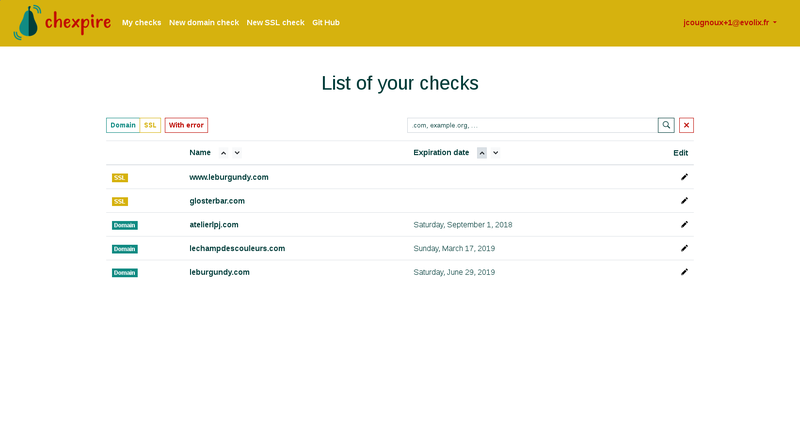 Chexpire allows you to define an unlimited number of personalized notifications (choice of the number of days and the email address) to be warned in a uniform way and adapted to your needs.